Our tropical garden visitors are interestingly beautiful and a delight to watch, to me anyway! There are many fantastic bugs and insects found loitering at our front yard when I seek them out, especially to photograph their details which is visibly unseen with my naked eye. Somehow their amazing forms and patterns stand out in macro images and I’m always astounded with their remarkable beauty! What a wonderful world we live in! This is one such beautifully winged insect that I was priviledged to interact with a few months ago. A real beauty with metallic bluish-black tones covering most of its thorax and abdomen, with some reddish brown pattern beneath the thorax as well as at its long narrow waist. Measuring about 3 cm long, this wasp flew threateningly towards me on a few occasions to ward me off, I gather from disturbing its task of collecting soil to build its nest. Its fluttering reminded me of a hummingbird and it was quite a lovely sight. 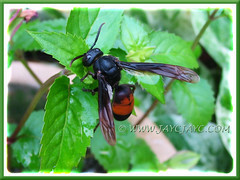 While strolling in our garden one sunny morning, I had an opportunity to observe this potter wasp dislodge a tiny lump of soil from one of our garden pots and carted it away! It was so engrossed in its task that I managed to snap two quick images. They are so called ‘Mason or Potter Wasps’ as they typically construct pot-shape nests of mud, though occasionally nest in burrows or deserted nests of other wasps. According to Richard Vernier of bugguide.net who generously ID this beauty for me, it is a Potter and Mason Wasp (Eumeninae) of the genus Delta. Great to put a name to this gorgeous beauty! A recommended read here on potter wasp with lovely images of a Yellow Potter Wasp (Delta campaniforme) and its pot building activities. Great captures to enjoy! 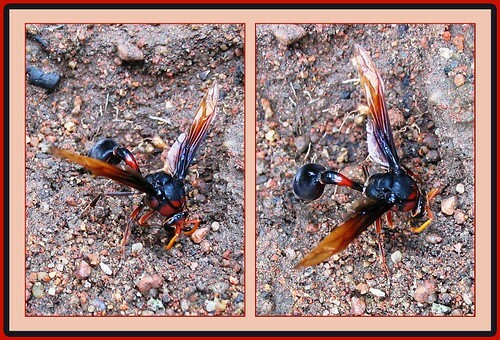 We were so blessed to have observed an orange and black potter wasp (a Delta sp. 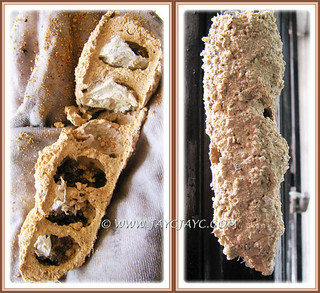 ), busily building its mud nest on our grill gate in August. When the mud nest was finally completed, it measured 11.5 cm tall and 2.54 cm wide. Awesome work of art! A joyful treat to see a nymph emerging from the mud nest about a month later! Recently, upon cleaning the grill gate where the wasp’s mud nest was attached to, we were surprised to notice the nest contained 6 cells, instead of 5 cells that we mistakenly estimated. Wow… likened to a 6-storey condo! See many more interesting images and details on its nest-building project at our site’s article here.